There's always that irritating classmate who keeps hogging the teacher's attention. There's always that burning question we decided wasn't worth the risk. We've all felt that disapproval when someone offers a really irrelevant answer that wastes everyone's time. And, most importantly, we've all asked ourselves: "What did that other guy say?" Now imagine if, every time your teacher asked a question, everyone could answer at the same time. You wouldn't even have to speak up if you were shy. And every valuable thought shared was recorded so you could remember exactly what happened in class, along with the number of classmates who agreed with that thought. A whole new way to Discuss. We designed Boards based on what we felt was really lacking in classrooms today - no, not a chalkboard, but the ability for anyone and everyone to participate, and the recording of thoughts shared for future reference. We thought it'd be cool to actually have a discussion board (pun totally intended) that could help us not only find answers to questions we have, but seek a whole variety of different views and perspectives from different people. That's why we built in a character limit - so that you wouldn't always have one really lengthy and sometimes irrelevant answer crowding out everything else. We also built in a plus and minus feature that's totally anonymous, so you wouldn't have to feel bad giving an honest opinion, and you'd be safe in the knowledge that the person you disagreed with wasn't going to hunt you down. 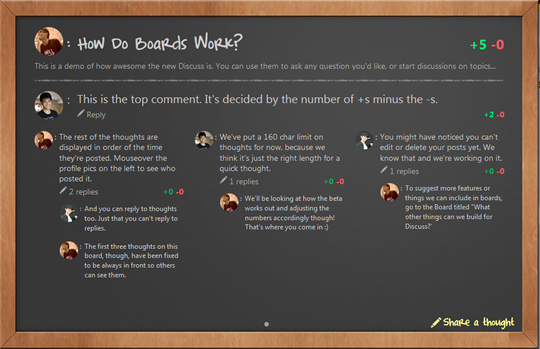 We also wanted to make Boards as fun as possible use, because what's the point of learning if you don't enjoy it? That's why we used chalkboards as the basis of how the Boards look. And if you remember how fun playing with the custom animations one Powerpoints was the first time you needed to do a presentation, you'd know why we made the Boards animate. And that's why you should come on Board (pun totally intended again). Note: Boards are currently in beta, and if you want to help us test it out, you could drop us a message on Facebook or Twitter.